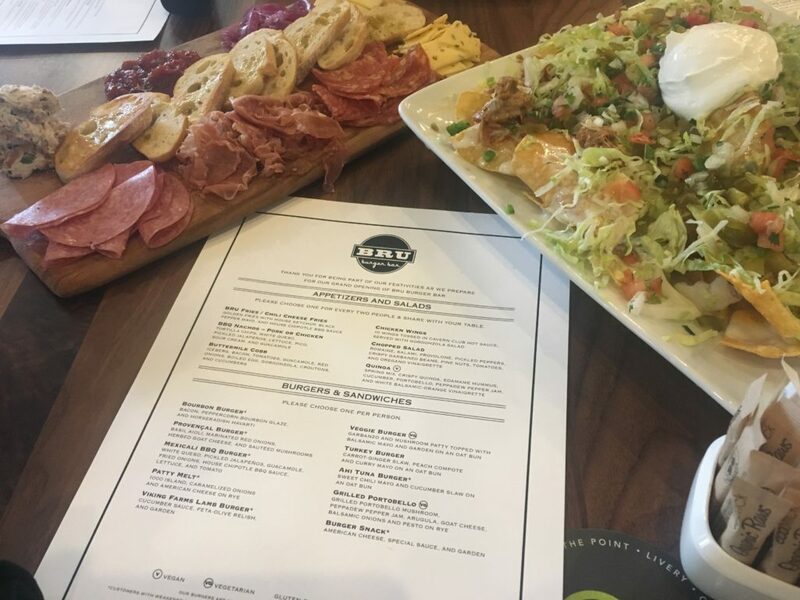 Our team had the pleasure of receiving a special invite to the soft opening of Bru Burger – downtown Lafayette’s newest dining experience, opening February 12th, 2019! Welcome to the Lafayette community, Bru Burger! Bur Burger now represents the face of the hamburger with 10 locations throughout Indiana, Kentucky, and Ohio. We’re glad to welcome this growing company to Lafayette, IN! One prominent factor to Bru Burger’s business plan is its active presence in the community. Bru Burger resources its daily functioning needs from all local places. That includes meats, beer, and other products for their menu items. This little detail means they’re loving our community well. Not to mention, paper straws and recyclable to-go containers prove their love our environment, too. We love this earth-conscious aspect of this company! Bru Burger’s design is an up-to-date modern finish with all kinds of seating. High tables, bar seating, booths, and more serve you with any kind of need. It’s strategic location by the Wabash River gives great access to some of the most beautiful views in Lafayette and West Lafayette, IN. Eat here and then go for a walk in both sister cities. The main catch and draw of the restaurant is their love for the American classic hamburger, but they offer so much more. Each burger- or item on their menu, for that matter- contains complementary flavors. Therefore, each item is truly flavored to perfection. Click here to view the entire menu to see what we mean! Bru Burger’s menu contains detailed preparation for the gluten free, vegetarian, and vegan diets. This company begs you to ask questions about what’s going into your food, and they’re ready with answers you want to here! Esquire names the Honey Chipotle BBQ Burger the “Most Over the Top” Burger of 2016. That’s a burger with bacon, caramelized onions, white cheddar, onion ring, BBQ pulled pork, and black pepper mayo. WOW! Of course, like an great restaurant, Bru Burger offers a wide selection of coke products, teas, and a full bar for alcohol. Come in to watch the game, hang out with a group, or date night. 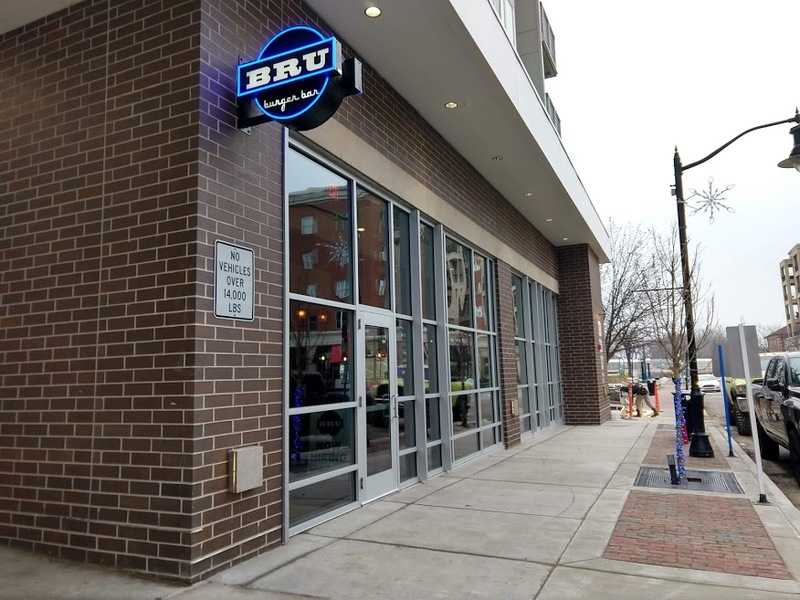 Lafayette, IN welcomes you, Bru Burger! 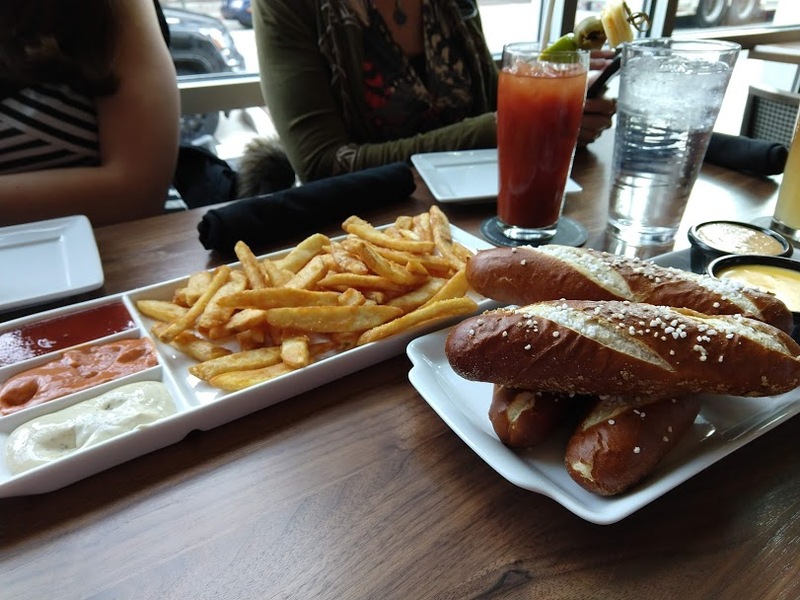 Yummy appetizers such as Bru Fries with house-made ketchup, mesquite BBQ sauce, and Peppercorn mayo, Chili Cheese Fries, and Soft Pretzels with beer cheese are just a couple of the menu options. 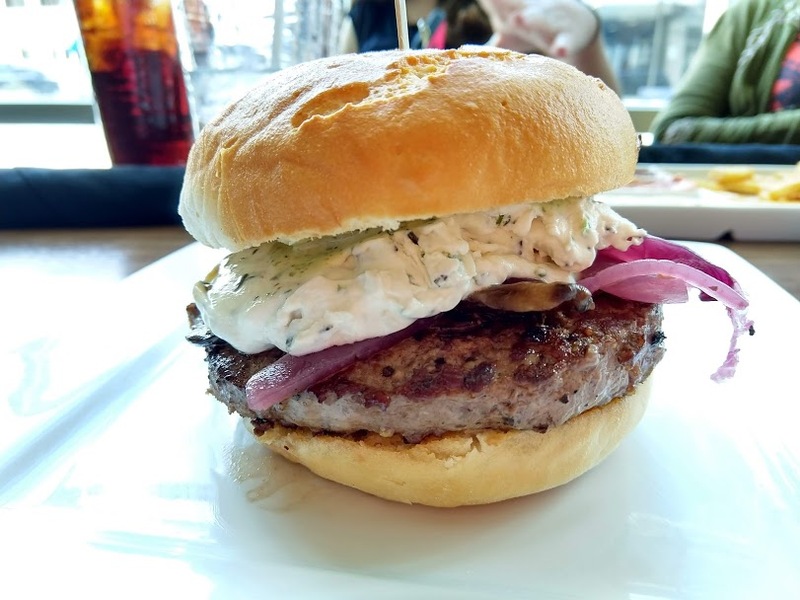 This is the PROVENCAL BURGER with basil aioli, marinated red onions, herbed goat cheese, and sauteed mushrooms on a gluten free bun! This is the Stilton Bleu Cheese Burger. 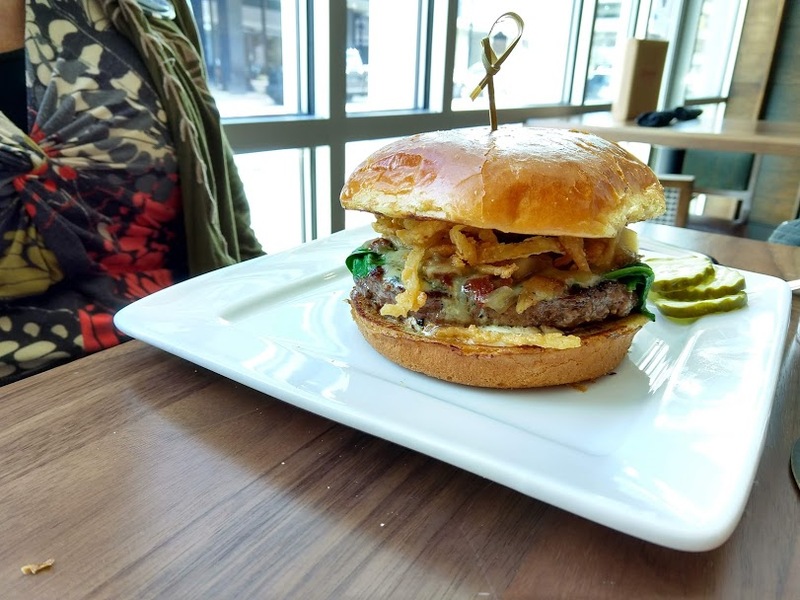 It’s topped with pear-bacon jam, fried onions, truffle aioli, and spinach. This one’s the Bru Burger! That’s Taleggio cheese, bacon, tomato jam, caramelized onions, chopped lettuce, and mayo! Yum! 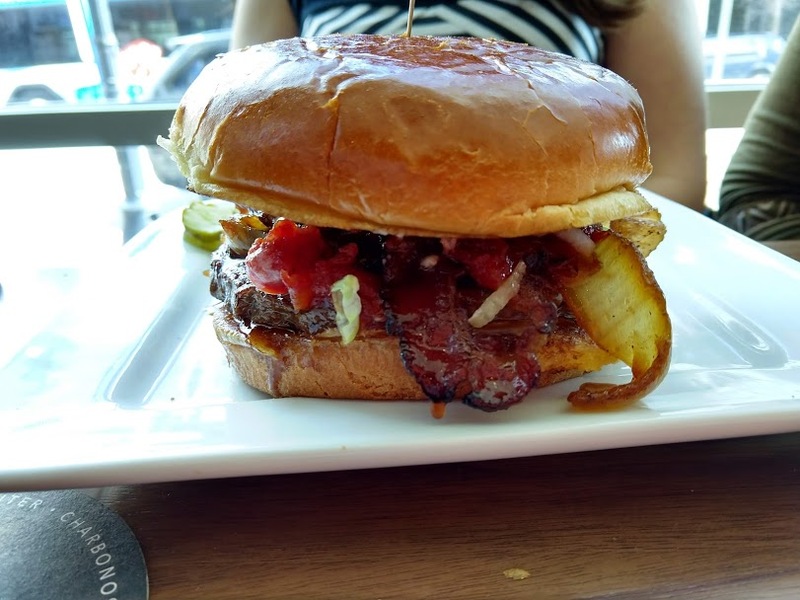 Open Monday – Thursday from 11:00 A.M. – 10:00 P.M.
Friday and Saturday from 11:00 A.M. – 11:00 P.M.
Sunday from 11:00 A.M. – 9:00 P.M.
Bru Burger has reviews available on Facebook, Google, and Yelp. Since this location is new to Lafayette, IN, please leave them a review for others to find in the future!